One can argue that the government was more directly responsible for the design of the skyscrapers and cityscape of Times Square than any of its specific architects or developers. 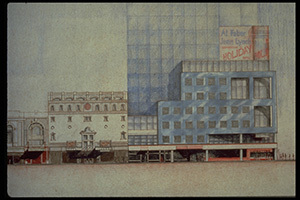 The Government, in the mechanism of the 42nd Street Development Project, defined and shaped the buildings' sites and massing. The consultants to the 42DP, especially the firm Cooper, Eckstut Associates, crafted urban design guidelines that mandated features such as setbacks, signage, and required percentages of masonry cladding. Government officials, especially the redoubtable Rebecca Robertson, president of the 42DP, who consistently insisted that all developers complied with the design guidelines created for the towers, the theaters, and the streetscape. 42nd Street Development Project Design Guidelines. Cooper-Eckstut Associates, 1981. 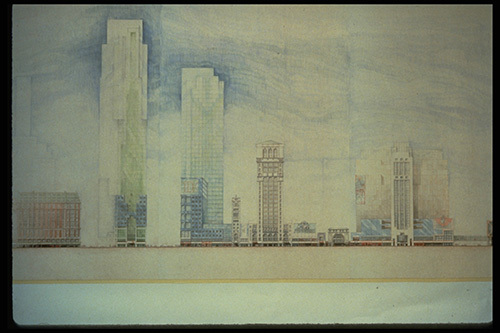 The drawings reproduced here are examples of their analysis and graphic suggestions about how the skyscrapers' maximum floor area allowed could be composed into buildings with tops that rose in a series of cutaway corners reminiscent of 1920s Art Deco towers that broke up the monolithic massing of typical modernist towers of the 1970s, such as the One Astor Plaza and the Paramount Plaza. Still, the gigantic scale of the new towers can clearly be seen in their contrast with the surviving early-20th century high-rises, and especially the historic theaters on 42nd St.
One of the Cooper-Eckstut strategies to scale-down the towers more comfortably fit into the streetscape was to use an overlay of masonry curtain wall and a pattern of window openings. This created a collage effect in a zone that related directly to the pedestrian. Signage reinforced the breakup of overwhelming scale and provided for a more animated street life.